This week I had a nice guitar here – a Gibson Chet Atkins CEC. The CE stands for classical electric, in other words a solid-body guitar with nylon strings and a piezo pickup, while the last C stands for conventional neck width (2″/5.1 cm at the nut, a CE model with a neck width of 1.825″ / 4.6 cm was also available). This guitar model was developed by Chet Atkins who approached Gibson with his prototype. The model appeared in Gibson’s catalogue in 1982, right at the time when Dire Straits recorded the Love over Gold album. This album features two songs – Private Investigations and the title track – on which a classical (=nylon-strung) guitar was used. 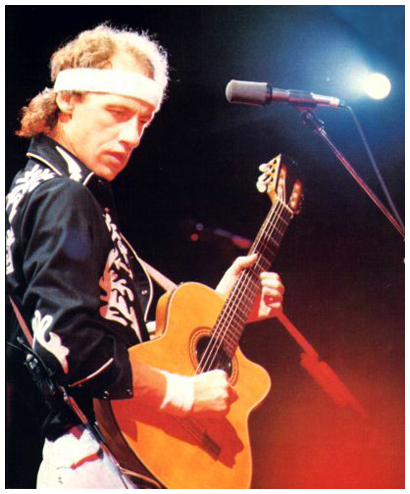 Note that on the album it was NOT the Gibson Chet Atkins, however, Mark Knopfler started to play it on stage for the Love over gold tour, right after recording the album. You can hear it e.g. on the Alchemy live album where it was used not only on Private Investigations and Love over Gold but also in the outro of Romeo&Juliet. Knopfler (probably) also used it on many sessions with other artists in the early 80ies, e.g. with Phil Everly or Paul Brady. The body is not all solid mahogany but features sound chambers to reduce weight and to make the sound more acoustic. The top is solid spruce or cedar. The neck is mahogany with a neck joint location at the 12th fret – like a classical guitar. The scale is 25 1/2″, the fingerboard and the bridge are from ebony. The pickup system consists of six individual piezos that are installed under the bridge. The pickup signal is preamplified in the control cavity (that consequently houses a 9V battery), a volume control and the (active) tone control is located on the rim of the guitar (later models have a bass and treble control). A really useful feature are six trim pots inside the control cavity that allow to adjust the volume for each string individually so that you can equalize volume differences easily. 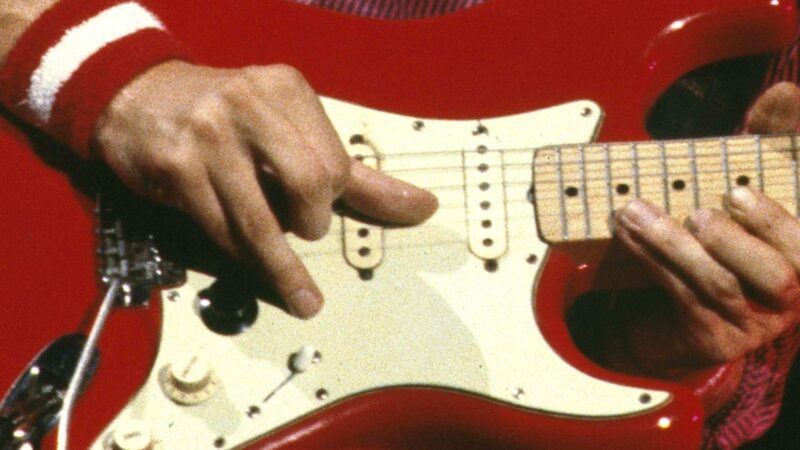 The guitar here i a CEC with the wider nut, I suspect – it is not easy to see on pictures – that Mark Knopfler had the CE model with the more narrow neck. For me the wide neck is nothing I am used to, nevertheless the guitar is not really difficult to play. The Gibson Chet Atkins produces a faithful classical guitar sound, and can be played even at high volume without the risk of feedback. Of course a ‘real’ classical guitar might produce the typical sound even better – for this reason Mark Knopfler probably replaced the Gibson with a Ramirez on the On Every Street tour in 1991/2. One problem of many classical guitars – and also of the example shown here – is intonation. As the bridge does not have individually adjustable saddles like on an elctric guitar, and neither a ‘compensated’ bridge design with different lenths for the different strings, the guitar never perfectly intonates all notes. If you tune the open strings, the bass note on e.g. the low e string is out of tune at the higher frets, and there is almost nothing you can do against it. I always loved the Chet Atkins model. I used to have the philosophy that piezo-electric pickups couldn’t capture your acoustic sound, so you were better off buying a guitar dedicated to that cause. The thin-line, chambered body allows you tweak the EQ more than you could with some Martin D-28 that has a Fishman in it. However, L.R. Baggs, Taylor, and Trance have come up with some amazing systems that have made me rethink my philosophy (I might put an LR Baggs Anthem in my old Guild). But, I still think for high volume, you can’t beat those old Chet’s, the Godin Multiacs, or Rick Turner Renaissance models. Fellow fingerpicker, Lindsey Buckingham, has used Chet Atkins models and Rick Turner Renaissance models quite a bit on stage and in the studio. They always produce a high-quality sound, without feedback. there’s also a track (can’t remember which one) on JI’s Glass album, with “gut strung guitar” mentionned on the booklet, and it sounds like nylon strings, so probably this one. I like the video of “Les enfants du rock” from 82 or 83, where Mark play on it licks from freeway flyer and Mississipi blues. The sound is a little bit drived by the amp, and it makes it so special : crunchy nylon sound ! Ayuda por favor!!!!! No consigo la chet atkins alpine todavia gibson las construye???? deseo comprarme ahora…ayuda por favor!!!!! Hi Vico, what is the problem with your guitar? amigo, puedes enviarme la que mas puedas de fotografias a mi correo e indicarme las caracteristicas tecnicas de la guitarra si es una ce o cec, si funcionan correctamente los potenciometros y el precio total, gracias de ante mano una abrazo. De estar acorde a mi presupuesto, podemos negociar. When I first purchased my CEC (Wine Red Color) from the Guitar Center I had asked their tech guy to raise the action a bit. Using a needle nose plier he pulled one of the pyramid shaped saddles off the bridge, clearing the way to removing the rest of them. At the time Gibson provided long plastic shims that precisely fit the area beneath the saddle. It was a while ago so details are sketchy but I think he used two shims. 15 years later now my high “E” is fretting out on the 3rd-5th frets so I am going to pull that saddle up and fashion a thicker shim for that one string. If you’re worried about mangling the saddle with pliers your fear is just. The GC tech guy tried his best but there is some disfiguration to that one saddle. They are indeed tight in there and a moderate amount of force is required to remove it. I hope this helped. I have a Gibson Chet Atlkins CEC in wine red. The G string does not have any volume when amplified.. How do I increase the volume on this one string? Second, do you know any guitar teachers in the UK that teach MK style ie without a fingerpick? Any idea where I can purchase the Highlander pietzo pickup for the Chet? The pickup cover just at the saddle is busted from years of travel. I have a 1987 Chet Atkins, color white. I think it´s a strange and amazing guitar because it plays and sound incredibly tuned and clear. Its in very good condition with just minor scratches and the typical Gibson lacquer craquelure. I play this guitar very few because simply don´t enjoy amplified guitars. I would sell it, depending of its value, to by a good acoustic martin or larrivvè. Anyone knows what would be the fair price for this guitar in Europe (Portugal)? tenho um amigo na minha cidade belo horizonte-minas gerais no brasil, que possui um chet atkins que muda de escalas(fingerbord) e assim muda a configuracao de afinacao a escala e presa por imas magneticos. gostaria de saber mais sobre a producao desse violao grato. I have the original CEC with the Baldwin pickup. The intonation problem was a real drag until I altered the bridge by creating separate compensated saddles that I glued to the top surface of the original pickup after making careful tests. The difference is amazing. And there’s something very present about that original pickup that I don’t hear in many of the modern variants. Gary, can you post up or link to some pics of the individual saddles?